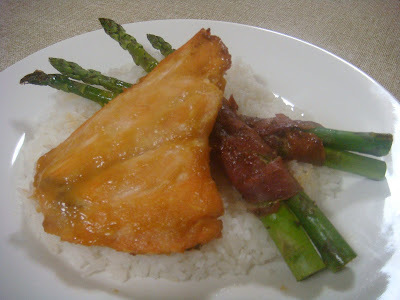 When I don't have much time to prepare dinner, I make this easy salmon dish. 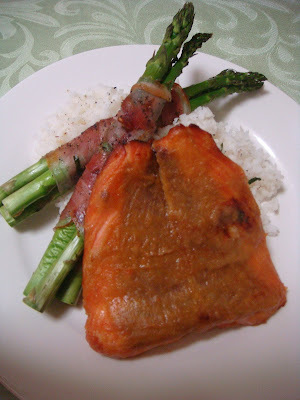 The miso sauce keeps the salmon flesh nice and moist and imparts a lovely, salty and smokey flavour when grilled. Keep your eye on the fish, to ensure that it does not overcook. Balance the flavours with some greens, such as spinach, broccoli, asparagus or bok choy, depending on what is fresh and in season! Combine mirin, miso and sugar in a shallow bowl. Add salmon fillets and turn to coat. Meanwhile, preheat a grill on medium and line a grill or roasting tray with foil. Drain the salmon fillets, arrange on the foil in a single layer and grill for 5-10 minutes, turning once and basting with any extra glaze, until tender and fish flakes easily. Serve with steamed rice. Chunky Miso Salmon Salad - Leftovers for lunch the next day!